Captain Dan, the Demon Dwarf, is no stranger to painful onstage antics, such as attaching a vacuum cleaner nozzle to his willy or having thousands of volts of electricity pumped through his body. But as the Circus of Horrors rolls into Kilmarnock, the diminutive performer has a sore head. The reason? Before last night’s show at the Strathpeffer Pavilion, he was sticking a white line to the edge of the stage to stop him falling off when… he fell off. It wouldn’t happen in a big top, but the perennially successful Horrors is a pioneer of taking circus tricks into theatres. For 20 years, the playfully gruesome show has undertaken an annual 100-date theatre tour, playing consecutive one-nighters in venues ranging from the 350-seat Whitby Pavilion to the 2,000-capacity Sheffield City Hall, which means adapting the show to a different space each day. “We have three different methods of rigging the aerial acts,” says founder John Haze, who stars in the show as singing ringmaster. “In one theatre, you can rig from a fly-bar. Another day we might have to go straight to the grid. A third option is to build goal-post trussing, which is free-standing. Back in the 1990s, the Horrors’ first theatre tour was a voyage of discovery. “In the 1940s and 1950s there were theatre circuses, but they all died out, so when we did it, it hadn’t been done,” says Haze, who inaugurated the show under canvas at the Glastonbury Festival in 1995, before heading indoors to London’s big-top-like Roundhouse. In the very first theatre the Horrors played, Haze almost came a cropper through something as simple as the unfamiliarity of working on a raked stage. During a sawing-in-half illusion, no one saw the need to apply the cabinet’s brakes. An early challenge was creating a show that worked equally well in theatres as in the big tops the Horrors also appear in. 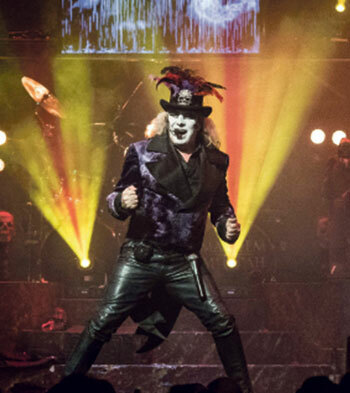 The Circus of Horrors travels in two minibuses and an articulated lorry, and employs four technical staff: a sound engineer, lighting engineer and assistant, and a truck driver who doubles as spotlight operator. The get in – or ‘build-up’, as circus people call it – is handled by the 21 performers and musicians, rather than a road crew. The multitasking extends to Haze juggling the roles of producer, director, performer and stage manager. 11am The performers leave their graves and padded cells (or hotel). 12pm The cast arrives at the theatre and builds up the set. 2pm The performers take a break while the crew checks the lights. 5pm Artists set the props and focus the lighting. 5.30pm Staff meeting to discuss previous night’s show and adapting the show to the current venue. 6pm Soundcheck for the band. 10pm Cast and crew take down the set. 11.45pm Drive to hotel in next town. The Horrors’ current show is called The Never-Ending Nightmare. One of the biggest props is a large bed that features prominently in the storyline. At one point, a performer floats from the bed. At another, several hands reach out of the bed and pull a sleeping figure through the mattress. The company also travels with seven multimedia screens. Health and safety is obviously a major concern in a show that includes a unique upside-down hair-hanging stunt. One performer hangs upside down by her feet, with a trapeze bar suspended from her hair, and a second performer does tricks on the trapeze bar. Accidents are rare, but happen nonetheless, as when sword-swallower Hannibal Helmurto was hospitalised after ripping his oesophagus in 2011. Neither the audience nor cast were aware of the injury at the time. “It was a couple of hours later when he came to me and said he wasn’t feeling too well,” Haze says. “Fire is the most dangerous thing in the show,” adds Haze, who is that rare thing: a fire-eater who is also a fire marshal. “When I’m in the middle of the stage eating fire, I know where the fire extinguisher is and how to use it. 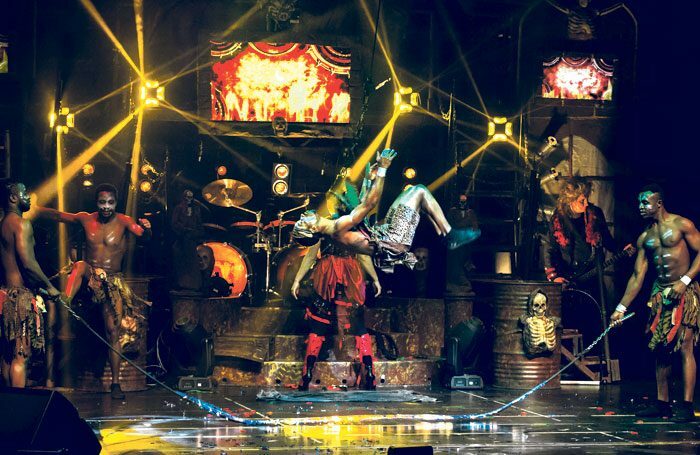 With the Horrors having so successfully put circus into theatres for the past two decades, other companies have followed their lead and moved indoors for winter tours, including the Chinese State Circus and, most recently, Zippos’ spin-off Cirque Berserk!. The Green Room: What makes an ideal colleague... or a nightmare one?